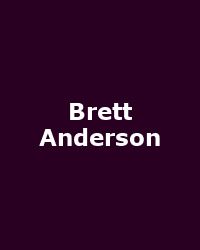 Look sharp - Suede troubadour, Brett Anderson, has announced a few dates for the beginning of 2010. Tickets go on sale now! The first night has been confirmed for January 22nd at the Shepherd's Bush Empire (£16 plus fee), the second night at Manchester's Academy (£15 plus fee) on February 8th and the final night at Glasgow's infamous King Tut's Wah Wah Hut (Over 18's only £15). Anderson has quietly carved a plaintive yet epic path since departing the influential (and influenced) Suede - he fronted the band The Tears with Bernard Butler but that was short-lived. He has since released 3 solo albums, the latest of which is "Slow Attack" which was due out today (2nd November) and is alleged to be more orchestral in its approach than on previous releases. There is also an exclusive new iTunes track called "Forest Lullaby" available too as well as a digital release of album track "The Hunted".